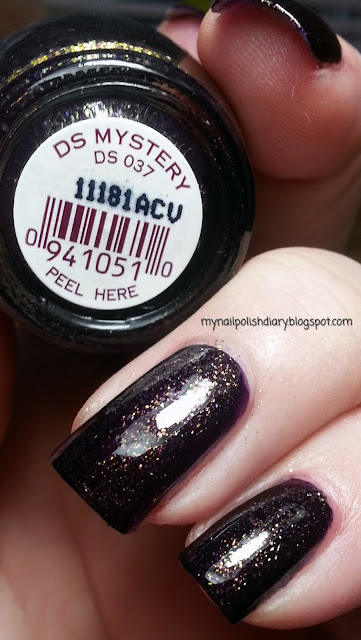 OPI DS Mystery from the 2009 Designer Series Collection is a dark purple jelly base with gold shimmery flakes. Or glitter. Whichever it is, wow. I like this one a lot. It's a mess for clean up though. After an intense clean up and then a shower it was fine. The wear time is typical. Application was a little tough. I think it's gotten thick over time and might need some thinner. Removal wasn't bad. I didn't use the foil method. I did, however, wash my hands and use a nail brush to get rid of the stray glitter. Zoya Share The Love promotion. Create an account and get a free bottle of polish, or add 2 more for a total of 3 and get free shipping plus a free bottle. Earn points to use as cash. I polish my nails...a lot! OPI Deutsch You Want Me Baby? all images are ©Tami Norman. You may not use them without my written consent. Theme images by suprun. Powered by Blogger.